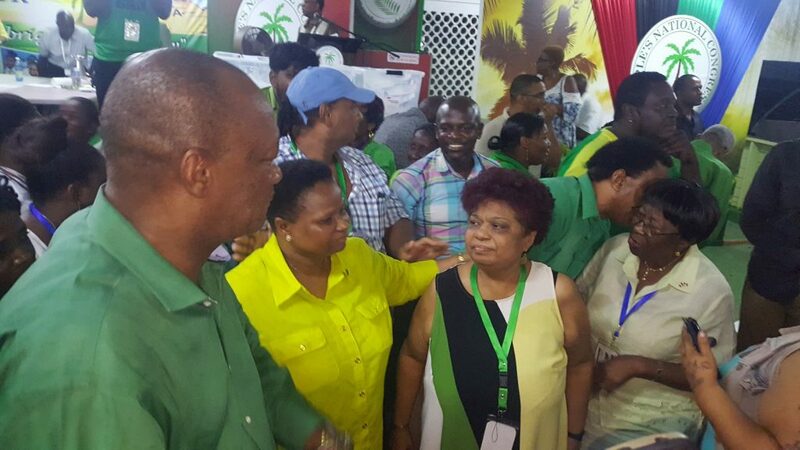 Defeated Joseph Harmon, victorious PNCR Chairman Volda Lawrence, PNCR General Secretary Amna Ally, and outgoing Chairman, Basil Williams behind Ally speaking with a woman. Volda Lawrence clinched victory to become Chair of the People’s National Congress Reform (PNCR), and at the end of the keenly contested race party leader David Granger assured that the elections were free and fair. “The process might have been slow and difficult but it was clean and complete,” Granger, who is Guyana’s President, said in his charge to the newly-elected Chairwoman and two Vice Chairmen. Lawrence, in brief remarks after Granger, thanked God -especially Christians. She said she does not bring gold or silver but a “heart for the people of Guyana”. Pledging to work hard to ensure her party remains in government for decades to come, she committed to supporting Granger and rallying the womenfolk for him. “I also pledge to work with our leader and leaders to ensure that we address the needs of our people and that we all work together in unity and as we leave here, let us remember that we all are members of the greatest party in this country- the People’s National Congress Reform,” she said in her victory speech. “To our leader, I say that I will walk side by side with you and I will bring the women with me and we will carry you and we will carry this party onward,” she said. Against the historical background that the PNCR’s has been allegedly involved in electoral irregularities nationally and at its internal elections, Granger said Sunday’s voting for office bearers for the next two years signaled that his party is committed to democracy. Outgoing Chairman, Basil Williams and Party Leader, David Granger. “We have a mission and what occurred over the last few days is a vindication of our commitment to the people of this country. The people have seen transparency, they have seen democracy, they have seen clean elections,” he said. Official results released by Returning Officer, Attorney-at-Law, Hewley Griffith early Monday morning show that Lawrence clinched the second top elected spot by 346 votes compared to Joe Harmon’s 287. The Vice Chairpersons are Annette Ferguson with 260 votes and Dr. George Norton with 242 votes. David Granger was re-elected as Leader unopposed as was Treasurer, Ronald Bulkan. Griffith said counting for the other posts on the PNCR’s Central Executive would continue later Monday. Sources said 829 votes were cast for the various positions. For the first time in recent memory, delegates did not vote for each candidate, but cast their votes for all of the candidates listed on one ballot. At least one person was heard insisting that the long established approach be used. Before the official announcement and when it was clear that Lawrence won, many of the remaining delegates and observers erupted into chants of “Unity, Unity, Volda, Volda” even as she and Harmon stood side by side and held hands in a show of unity. For party leader, President Granger, he highlighted that the party was united, despite weeks of a bruising campaign especially between Lawrence and Harmon across Guyana and overseas. Outgoing Chairman, Basil Williams who mustered 183 votes did not campaign as intensely as the two other contenders. “They might have been rivals in the campaign but they are colleagues and they’ll all be at Cabinet on Tuesday morning,” Granger said, noting that the internal party contest was over and the campaign for the November 12, 2018 general elections campaign has now started. “There are no victors, there are no victims. We are all working to a common destination and we are all working for the common good,” he added. Granger said “at the end of the day we are one party” which is important to its members and country. “I mention these two things: your holding of high office in our party and the holding of high office in government because in the final analysis it’s Guyana that counts. They serve the party but they serve the country first and tonight has been a demonstration of that dual responsibility,” he said. The PNCR Leader used the opportunity to state that his party was leading Guyana into an era of greater social equality among all geographic regions, ethnic groups and social classes while at the same time being ready to meet with its political opponents. “We are leading Guyana forward into an era of inclusionary democracy in which we are prepared to meet and speak with our political opposition and members of civil society,” he said. Appealing to party members to “keep faith with us” over the next few years where there is safety and social cohesion in contrast to the period under the People’s Progressive Party-government that has been characterised by heavily armed gangs and death squads that had resulted in the deaths of hundreds of civilians and law enforcement personnel. 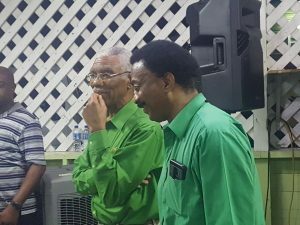 Harmon was nowhere to be seen after the speeches were delivered, but outgoing Chairman, Williams said he did not lose although he polled the third lowest in his bid to be returned to the post of de facto deputy leader. “The party has decided it’s time for a woman and I’m happy for Volda,” said Williams who has served three terms as Vice Chairman and two terms as Chairman. “I don’t think I lost. I could have stepped aside …I didn’t campaign but I had a purpose for staying in,” he said. When pressed on why he thought he did not lose even though he came in third, Williams suggested that he stayed in the race to ensure Harmon was defeated. “Look at the effect of those votes. Anyone could have dealt with them; the second place man could have utilised my votes. It was a great decision for our party. I am happy to have been part of it,” he said. A well-known Stabroek Market vendor, on leaving Congress Place- the PNCR’s headquarters- remarked openly that, “We ain’t want no PPP crew in here. BK got to pack up and leave” in apparent reference to Brian Tiwarie who was at one time closely associated with the PPP. Harmon and Tiwarie are also believed to be longtime friends. A delegate from Region Nine (Upper-Takatu/Upper Essequibo also praised Lawrence for being supportive of the Amerindian communities in that southern Guyanese region. “Ms. Volda is the only person does go to Region Nine and visit the Amerindian communities. Harmon and Basil don’t go anywhere,” the woman said.